In 1943, Flying Officer Derek Gray of Britain’s Royal Air Force crashed his Spitfire in the remote Australian Outback. Without food or water, he survived four days and nights in mangroves infested with giant salt water crocodiles. The Top End of Western Australia, One of the world's most hostile places. in 1987 men from the Australian Royal Air Force (RAAF) journeyed to this remote and inhospitable place to recover this old war relic. Experience with them the dramatic tides, the clawing glutinous mud, the extreme heat…..the sharks and the man-eating crocodiles. Spitfire at Crocodile Creek is an adventure story like no other. A story of guts and determination……..of men battling the most extreme of elements. It’s also a story about aviation history. About the famous Spitfires and the men who flew them. And, it’s a story about one of natures most feared predators….. the prehistric crocodile. Join us, and discover the intriguing reason for Derek Gray’s ill-fated flight just days before Christmas in 1943. Meet a World War 2 Spitfire pilot as he returns to the cockpit after 45 years to relive his heroic days flying an aircraft with no fuel gauge and no navigational equipment. And come hunting crocodiles with a real life Crocodile Dundee. 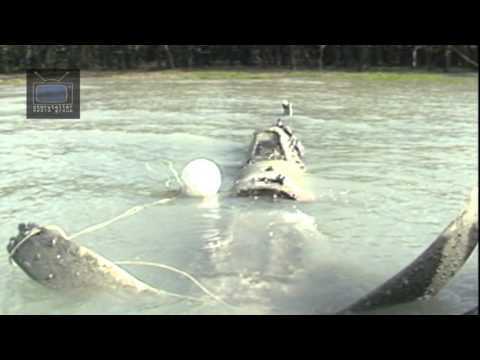 Spitfire at Crocodile Creek, a 55 minute documentary by Storyteller Productions. Storyteller produce and distribute documentaries and factual programming specialising in animals and nature; from endangered species and what's being done to save them to mysterious animal and monster stories.